NEW DELHI: At a curtain raiser event, the IET India IoT Panel announced the second edition of the IoT India Congress 2017 – a two-day mega event on the Internet of Things that will be held on September 14-15, 2017 in Bengaluru. Aruna Sundararajan, Secretary, Ministry of Electronics & Information Technology, Government of India unveiled the event in New Delhi. N Sivasailam, IAS, Additional Secretary Department of Telecommunication also graced the ceremony. The IoT India Congress is conceptualized and designed by the members of the Institution of Engineering and Technology’s (The IET) IoT Panel – an independent and neutral visionary think-tank led by select industry leaders. The panel envisions laying a solid foundation by supporting policy makers, industry in the next step of adoption of IoT. The conclave aims to help uncover new business opportunities, outcomes and revenue streams, help move research forward to create newer technologies, discuss governance and policies and thus create a roadmap for the evolving movement of IoT in India. A panel discussion featuring senior leaders from the industry was organized as part of the event. The discussion was moderated by Shekhar Sanyal, Director and Country Head of the IET and the panelists discussed the theme ‘Is IoT the platform India has been waiting for’. The IoT India Congress 2017 will bring together the key stakeholders across the value chain and industry vertical to discuss the impact and potential of Internet of Things in various sectors like Healthcare, Manufacturing, Smart Living and the New Technologies in IoT. The Congress will have exhibition space, experience zone, award series and mentoring and advisory sessions facilitated by veteran technologists. 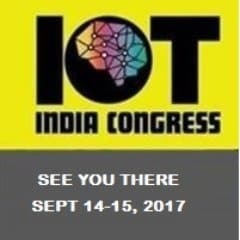 Come September, Bengaluru will host the second edition of IoT India Congress 2017 0 out of 5 based on 0 ratings. 0 user reviews.